The svelte compactness of a laptop poses a challenge for computer musicians: how do you play the thing? 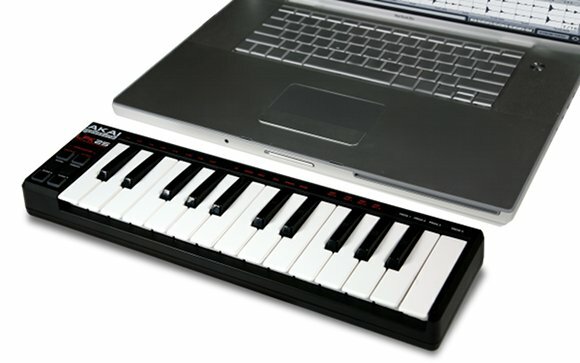 A typically-sized music keyboard kills the laptop’s portability and small footprint. That makes a compact keyboard a no-brainer. This month, both Alesis and Korg have new compact offerings, each USB-powered, small, and cheap. And as a side note, I see a very different product opportunity not served by either one …but more on that in a bit. 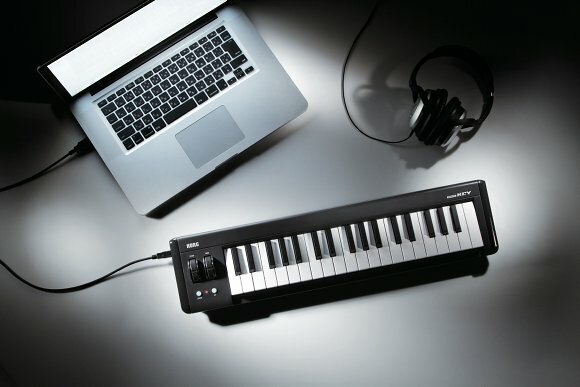 Korg’s microKEY fits 37 mini keys from the microKORG XL and microSTATION into a USB-powered keyboard. I actually quite like playing the microKORG: the action and size could certainly be described as “toy-like,” but they’re consistent enough to be good fun. It’s a badly-needed product offering, because Korg’s otherwise terrific nano Series is marred by the awful keyboard, which offers few advantages over your laptop’s existing QWERTY keyboard in feel or control and has key caps that chronically fall off. The Korg also nicely trumps Akai’s LPK25, seen below. The LPK has mini keys, but only 25 of them. The Akai sports an arpeggiator and tap tempo, which is cool, but I expect most users would rather have pitch and mod. And while the Akai is USB-powered, it lacks the USB hub. I also really don’t like the feel of the LPK, personally, so I think the Korg bed wins out. But wait — Numark/Akai/Alesis respond within days with their own offering! Full-sized keys – but still compact (updated): Dimensions: 19″ (w) x 7.25″(d) x 2 3/8″ (h) Weight: 4.6 lbs. That’s heavier than the Korg, but you get full-sized keys. And it’s actually roughly the same size. The Korg is, in fact, wider, if shallower and ever-so-slightly less tall, at 22.24″ x 5.47″ x 2.13″. UPDATED – yes, we have MIDI. As echolevel notes in comments, there is indeed MIDI DIN on this keyboard. So there you go – that counts as an advantage over the Korg. So, the Alesis is also absurdly-cheap. Instead of being ultra-compact as the LPK and Korg pieces are, it falls more into “very compact.” That may make it perhaps more of a rival for M-Audio’s Oxygen – minus the handy knobs and transport controls – than the Korg above. Which one would I choose? Well, as I said, if we’re going to go ultra-compact, I’d choose one that goes all the way and is fun to have around. While we don’t know the price, that means the Korg looks to me like the winner – I’ve got plenty of full-sized keys around, as do you, I suspect, so why not cram 37 little keys next to your desk? It’ll be just fine for playing fun little synth lines. On the other hand, I can absolutely see some people picking the full-sized keys. So, if two octaves is enough for you, you actually get a narrower keyboard in the Alesis that only adds a little bit of depth and weight versus the Korg. I’d rather have 37 keys than 24, but if you’re playing basslines, that could make the Alesis a winner. Of course, all bets are off until we see the actual models. And what I really, really want isn’t here. I have no doubt that Alesis/Akai and Korg are dead-on in terms of what will sell well in the market. But indulge me for a moment: what if we had something really unique for more boutique interests? A MIDI port, so it could be used with portable synths and not just computers. Don’t want to take up the space for a giant DIN? Why not use S-Video on one end, MIDI on the other? Updated: Readers are already suggesting some existing offerings… check comments. In other words, I’m actually asking for something more expensive – but something I’d buy once and use forever. And I want something that’d work with hardware, minus the computer. The market clearly wants cheap and light, whereas I want expensive and heavy. I don’t think the industry is going to do it any time soon, which suggests what we really want is a DIY effort. Now, DIY keybeds are out of the question, but presuming you could order a reasonable quantity of beds and get custom casing, this otherwise isn’t impossible. And open, kit-based design means people could customize such things with novelties like ribbon controllers or tilt sensors. The DIY community has thus far limited itself to mainly simple designs – the monome, gorgeous as it is, is just a light-up grid of buttons. Maybe it’s time for an open keyboard. Keeping price down isn’t easy for the industry in big volumes; in small quantities, it’s a major, major problem. So how much would you pay for such a thing? And anyone want to comment on feasibility, or whether I’ve just lost my mind? Oh, and in the meantime, yes, I’m sure a lot of those Alesis and Korg keyboards will sell. We’ll have a look and let you know how they are. So, feel free to comment on / ask questions about either the real-world or pipe-dream possibilities.